Formica Limited is pleased to announce the introduction of its new Formica® Compact Top range. Compact Top provides a high performance, damage-resistant homogenous solid core laminate for environments where the upmost protection is required. The range offers a practical and robust design application for laboratory and industrial services and compliments Formica Limiteds advanced chemically resistant product, Formica® Chemtop2. A durable material, Formica Compact Top is ideal for use in laboratories, healthcare areas, schools and other industrial interiors where harsh substances are often used. In a 16mm thickness it has inherent structural solidity and dimensional stability making it ideal for horizontal and vertical surface applications, including benches, tables, splashbacks, screens, fume cupboards, cabinets and shelving, furniture and wall panels. Simon Wild, Marketing Manager UK and Ireland, Formica Limited comments: Offering such a specialised, high quality structural laminate means Formica Limited can provide specifiers and designers with a highly practical, affordable solution for industrial and laboratory furniture, where hygiene, quality and damage resistance are paramount. Compact Top offers a range of nine designs in a Velour texture and 3,660 x 1,525 x 16mm sheet size. It has a decorative face on both sides of the sheet, providing the perfect choice for vertical and horizontal applications. It can be cut, shaped and routered to produce contemporary and practical interior solutions, and its black core acts as a striking edging design feature which can be cut square or bevelled and highly polished. Compact Top meets the requirements of EN 438, ISO 4586 and produces the highest performance levels specified in BS 4965, providing an easily maintained, hygienic surface. Both Formica Compact Top and Formica Chemtop2 are unrivalled for high stress applications within laboratory and industrial environments. Solid core laminate in a 16mm thickness provides a robust, resilient material that is perfect for many industrial applications. Formica Limited is the market leader and only manufacturer of High Pressure Laminate in the UK and Ireland and continues to develop innovative surface materials for a wide variety of applications and market sectors. For more information please contact either; Kim Mason [email protected] or Louise Gough [email protected] at the Think Tank - 0207 336 6623 About Formica Limited: Formica Limited creates beautiful and useful surfaces for many diverse environments and applications. It is the market leader and only manufacturer of High Pressure Laminate (HPL) in the UK, as well as being a manufacturer of a wide range of other interior surfacing materials. Formica® laminate is the original, and 95 years of innovation and manufacture was celebrated in October 2008. The company has developed an unrivalled expertise, which ensures quality, reliability and products that are fit for purpose. Working closely with architects, designers and specifiers, the company is ideally placed to offer innovative new products and decors which respond to market needs and complement current design trends. Its innovative and complementary products include HPL in a wide selection of colours, designs and textures; some even incorporating real metal foils and wood veneers. Other surfacing materials include Solid Surfacing by Formica®, structural Formica® Compact with its solid laminate core and ColorCore® by Formica® with the same colour throughout. 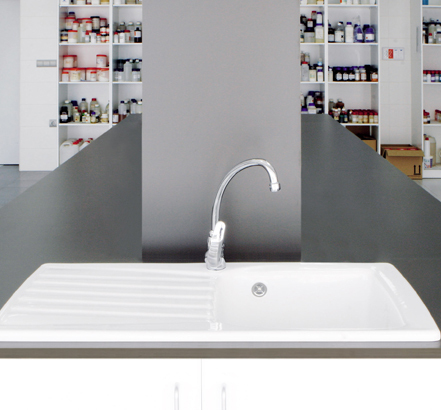 Specialist laboratory sector products Formica® Compact Top and Formica® Chemtop2 with enhanced chemical resistance and the Axiom by Formica® range of worktops and accessories for the kitchen complete the portfolio. Formica Limited supplies millions of square metres of laminate and hundreds of thousands of pre-fabricated kitchen worktops and associated products across the UK and Ireland, from its two factories in the North East of England. It also draws on Formica Corporations worldwide manufacturing facilities when required. Latest products from Formica Limited include Sculpted by Formica®, Formica AR plus® High Gloss Plain Colours, new texture introductions to ColorCore® by Formica®, a range extension of Solid Surfacing by Formica® and Formica Compact Top. Please Note: Formica, the Formica logo, Chemtop2, DecoMetal, ColorCore, AR plus and Axiom are registered trademarks of The Diller Corporation.